This trip has been in the works since last fall, so I’ve had a lot of time to think about what I’m packing. 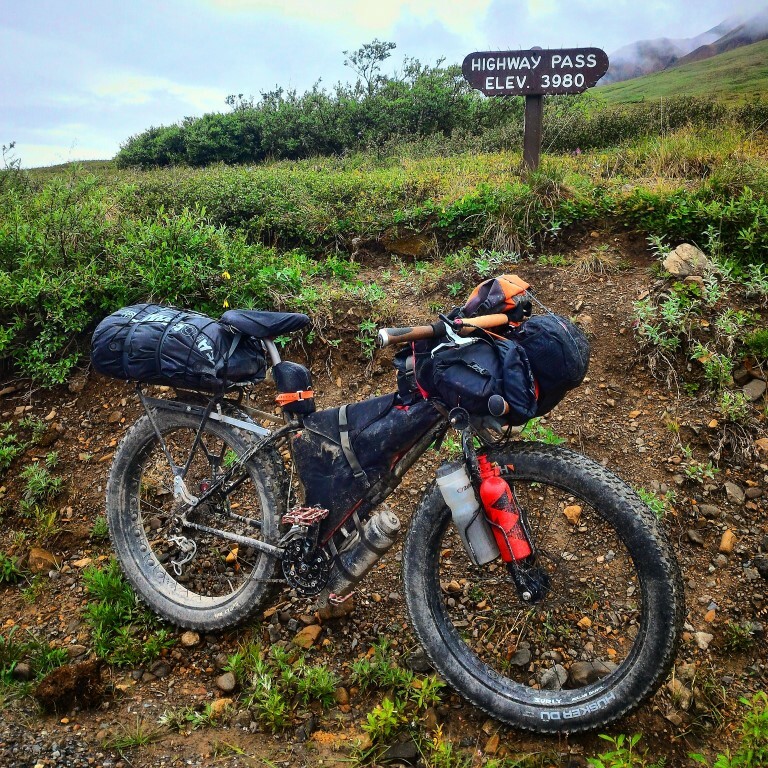 The plan is a human powered, with a little hitchhiking, wander around Alaska. Two summers ago I spent a few months up there and before I even left, I planned on returning with a fatbike. I also knew I wanted to go deeper into the wilderness, so my packraft, backpack and trekking poles weren’t being left behind. All the additional gear definitely adds up, both in weight and volume, but I’m willing to accept the trade off, at least for now. I also figure gear can be stashed, held by someone, or mailed ahead as needed. Besides, even with all this extra gear the bike weighs less than many loaded touring bikes I’ve checked out. I like new gear as much as the next person, but most of the gear, while not the lightest and latest, I already had. I really try not to replace still functional gear and fortunately I have a pretty deep gear closet to pull from. Update 9/3/16 – As the trip evolved, I shed some kit, and items with a strikethrough were mailed home. Small plastic spatula – for scraping the bottom of pots and jars. Leatherman Rebar multi-tool – used for everything from food prep to opening faucets without handles. Olympus 14-42mm f/3.5-5.6 lens – this stays on most of the time. ASUS ZenFone 2 ZE551ML – an unlocked, dual SIM Android smartphone / phablet that I’m also using as my computer and GPS with the apps Maps.me, Gaia GPS and Maplets. Brunton Ember 2800 solar charger power pack – power booster for my USB electronics. MSR 6 liter Dromedary Bag – boosts my water capacity to two days for the long, dry stretches. Tyvek postal envelopes – free stuff sacks for organization.